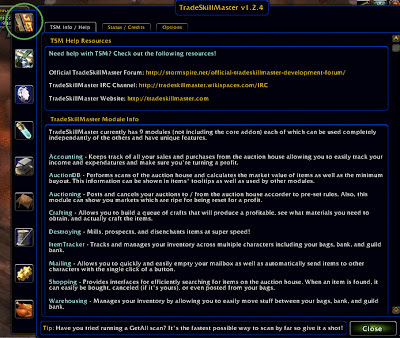 In my last post, Handera asked how I set up my TSM_Crafting module to make enchanting scrolls, so this is just going to be a short post in response to his question. 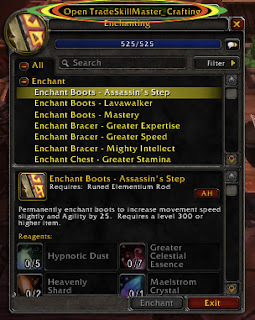 He said that he uses it for glyphs, so this post is going to assume a general knowledge of TSM_Crafting, but not the specific enchanting parts. Step 2: Go to Options, and check the box "Override Minimum Profit"
Step 3: I use both Percent and Gold Amount. 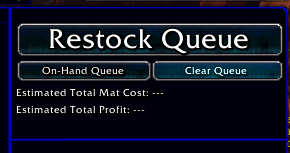 My Minimum Profit (in %) is set to 50% and my Minimum Profit (in gold) I set to 150g. This ensures I'm making a good return on my investment AND each scroll is (theoretically) making at least 150g, at current market prices. So that's basically how I set up the options before I craft. Making non-Cataclysm scrolls is acceptable, granted they are profitable enough. 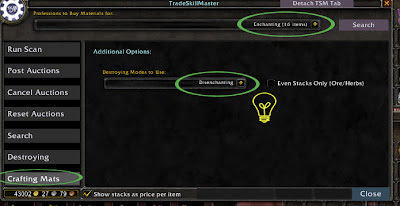 When you open the TSM window at the AH, click on "Crafting Mats", and make sure only enchanting is selected in the top, and for Destroying modes to use you can have Disenchanting selected (disclaimer below). If you do have Disenchanting selected, it will bring up search results like this, if not it will only bring up the mat you need to craft, which is less time consuming, but you can find some good deals this way. Explanation of Above: We're searching for Greater Cosmic Essence here. The top item (when disenchanted) will turn into GCE at a certain rate. 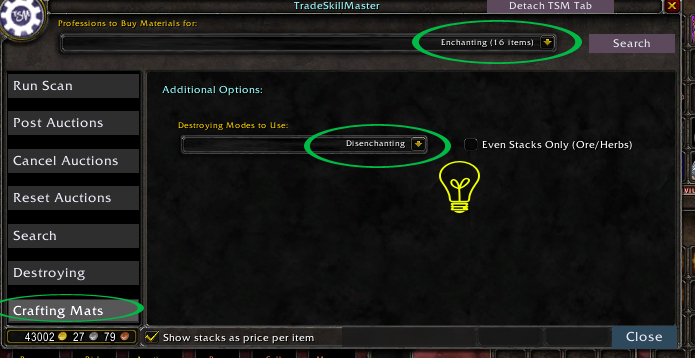 On average disenchanting this item that costs 17g will yield a GCE that cost 15g11s11c. In this case I would just by the GCE for 19g 26s 90c, as I only need 6 of them (shown on the right under "Need"). 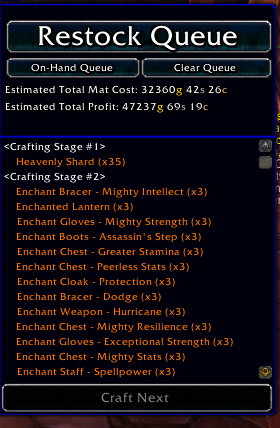 Note: Using this method comes up with many items can turn into either Dust or Essence, and it's a random proc, so unless the deals are like 25% off or more of the raw mat, go with the mat itself. From here you can go back to the profession screen and craft all your scrolls, or use TSM_Destroying to DE all the weapons/armor you bought, then craft. The one thing I would highly suggest doing when using this method is if you do the obsidium/elementium shuffle, disenchant the rings/necks before doing these searches. The shuffle is THE utmost cheapest way to come up with these mats on probably any server. If you're looking to optimize profit, that's the route to go! For more gold making tips, follow me on twitter @PhatLewtsGold! A while back I posted a few twinking searches for level 77 twinks. The idea here is that at level 77 you can get your hands on some ridiculously OP Cataclysm BoEs and melt faces in BGs till you ding 80 and move up to the 80-84 bracket. 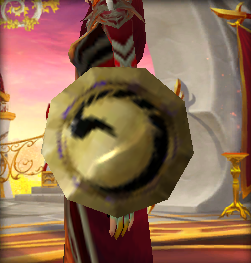 Since many mains will have hit the point in the expansion where they "can't get better", we may see an influx of alts coming in that will buy this stuff up like candy. What do these searches do? This is your bread and butter of this market. 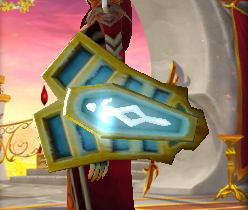 These weapons provide the longest term usage over the 77-79 range where cataclysm armor is available to newbies. This is the fastest of the turnover rates. NEVER buy anything called Dreadmaul _________ of the Tiger. This is plate gear with agility and hit as stats DON'T DO IT! Pricing - I price these at 499g99s99c across the board, I only buy at 250g or less. These 2 searches will look for a select few items. These items are of rare quality and are usable by level 78s and up. These are the only Cata level 77-79 Rare BoE items. Depending on your server there may be an overabundance of these, or none at all. 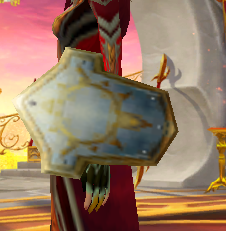 The best selling item in this group for me across 3 servers hands down is Alpheus Legguards. Pricing - I price these at 999g99s99c across the board. I tend to buy at prices up to 750g when there is only one on the AH (but in general I would suggest no more than 300-400g). This isn't a get rich quick scheme. If you have gold laying around that you don't have invested in anything, this is a great investment! 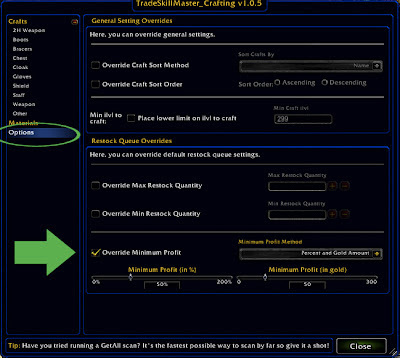 I have used it to make tens of thousands of gold on servers I rarely play on, and see this as a GREAT way to build your capital through high returns! If you're interested in seeing a breakdown of my personal returns from this method check out my recent post. I find this method to have very little time invested for the great return you get, and it's an amazing asset to add to one's gold arsenal. If you enjoy this post follow me on Twitter @PhatLewtsGold for more gold making tips! 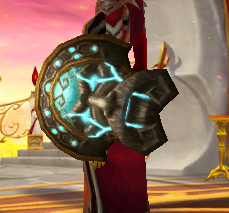 I created another mogging list that has been off the radar for some - Shields. 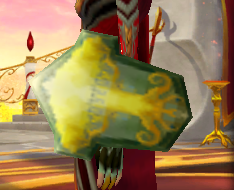 I've had quite a good return selling shields on both My main (low/med pop) server and Lightbringer (high pop). What I was doing is going through all the shields for sale by hand and buying them. This worked great on my low/med pop server, but on higher pop servers there are lots of crafteds, and low level shields that look very bland, and up to 3 pages of 50 shields a pop to look at. So I decided to make an Auctionator list to simplify my searches. This left 183 shields, that I arduously went through models of one by one, to pick out a list of 50, and here it is, hope you enjoy it! Use this list with Auctionator and Mogit for maximal results! (Check out my last post for the link to Jim's video on importing Auctionator lists). This list includes what I think are the best 50 BoE shields that aren't crafted. Import this list to Auctionator, then use the mogit addon to mouse over the ones that come up to see if the price is within your range! Hope this list becomes a great addition to your mogging arsenal! Follow me on twitter @PhatLewtsGold for more gold making tips! They were for sale for a measly 10 gold. Since they were Rare BoE's, they were on no current mogging lists on Power Word: Gold (which are the ones that I use for greens) or elsewhere. 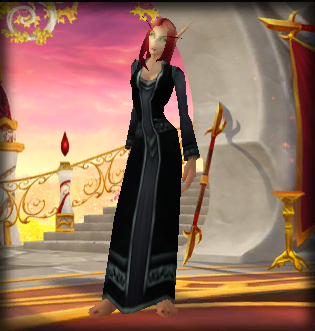 In less than 48 hours I flipped these robes for 2500g. Forget the price right now, but this made me realize that there should be some buyout lists for Rare Chests in Auctionator, maybe even shoulders and pants, but that's for another day. My list is comprised of BoE Rare chests. 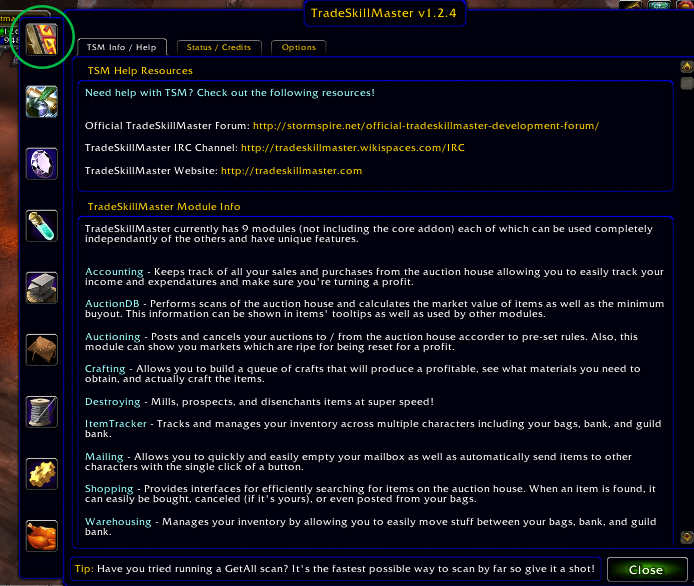 Basically I moused through wowhead, and searched through rare chests with 2 filters: BoE and not made by a profession. From that pool I clicked through through and chose the good looking ones, and ones that could possibly compete with my common mogging list items. With out further Ado, here are the lists I came up with! Enjoy! To use this list just go to the list and hit "search all". If you have the condensed list, it will take a while, but is well worth it! Using this list with mogit will help you determine what price threshold you can buy for, and it will be wonderful. Champagne will rain from the heavens, and you will be hailed a mogging god!! Hope this helped streamline a bit of your gold making from mogging, good luck!